A great way to keep your dog fit, and lose some weight. Working and sporting dogs maintain optimum condition throughout the winter. Post surgery or injury rehabilitation under your vets direction. 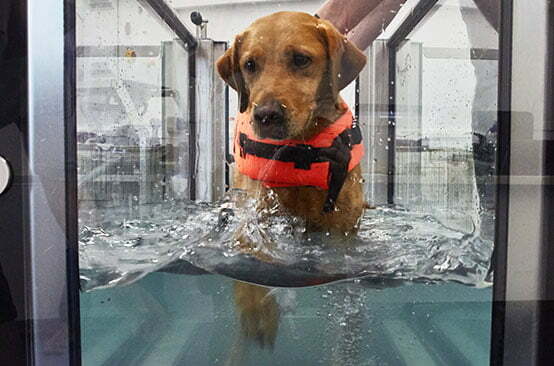 Why use a canine hydrotherapy treadmill? Treadmills give the therapist far greater control and visibility of the limb placement and movement. This supports tailored programmes that are specific to the individual needs & abilities. Bromine is an effective low odour water sanitizer with far less risk of skin and eye irritations. It is widely used in human spa facilities in preference to chlorine. Warm water temperature relaxes the muscles, increases circulation, relieves pain and aids comfort. Buoyancy reduces the load on painful joints and improves both core stability and flexibility. Surface tension adds resistance to specific muscle groups and improves stability. Hydrostatic pressure increases metabolic rate and calorific burn. Reduces heart rate, arterial pressure and supports improved circulation. During the initial appointment we would like to to get to know more about your pet. A gait and fitness assessment will be performed, and we will discuss with you an appropriate programme. We do not guarantee the full use of the treadmill during this meeting, but we will introduce your pet to the equipment and environment. Prices will be based on on the vet / physio programme requirements, which will differ dependant on the patient’s condition, general health and stage of rehabilitation. Written agreement from your vet is required prior to booking appointments. Please see our Terms and Conditions for hydrotherapy. Cancellations made within 24 hours of appointment are chargeable.